Dramatic Play- blood test lab! Bean, age four, had to have a blood test last week. He was a very brave boy. He was actually more interested in the collector’s job, and looking at all of the cool things she had in her office. She was totally awesome and gave him a few little things to take home- label stickers, some plastic droppers and test tubes, and a teddy bear knitted by the Red Cross ladies. 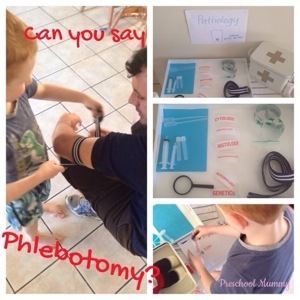 He was so excited to set up his own little QML at home and take everyone’s blood for testing. Previous Post Isla and Me children’s headbands!